Fresh off his triumph with the Godzilla reboot, Gareth Edwards is taking on another monumental challenge: transforming Star Wars into just a single series of films into a Shared Universe of films. Edwards will direct the first standalone Star Wars film, coming December 2016.
Who's this film about? The Lucasfilm press release doesn't say. We'd heard the first solo-character spin-off would be about Boba Fett, that enigmatic helmeted bounty hunter. 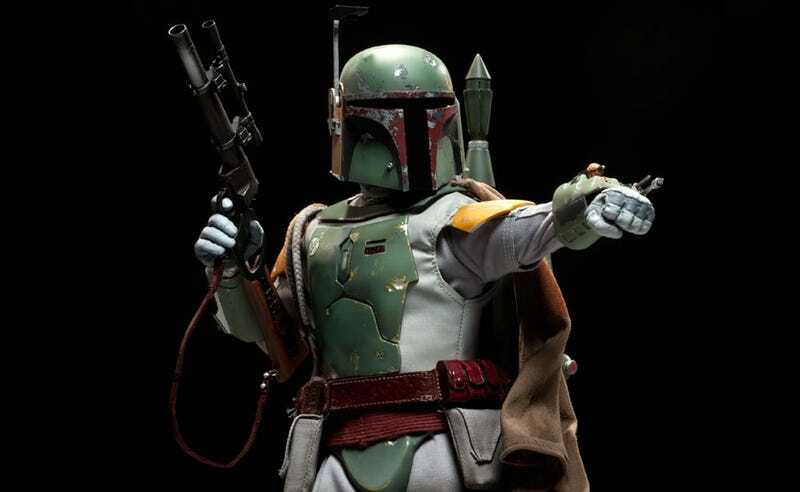 But we'd also heard the Boba Fett movie would be written by Lawrence Kasdan — and apparently this unnamed movie will be written by Gary Whitta (The Book of Eli, After Earth). In addition to the episodes of a new Star Wars trilogy, Lucasfilm and Disney have begun development on multiple stand-alone movies that will offer new stories beyond the core Saga. Gareth Edwards will direct the first stand-alone film, with a screenplay by Gary Whitta. The film is due outDecember 16, 2016. Gareth Edwards blazed into the filmmaking forefront with his acclaimed work on Monsters, a film he wrote, directed and served on as cinematographer and visual effects artist. The skill and vision readily apparent inMonstersearned him the high-profile spot directing this year's smash hitGodzilla. "Ever since I sawStar WarsI knew exactly what I wanted to do for the rest of my life - join the Rebel Alliance! I could not be more excited & honored to go on this mission with Lucasfilm," said Edwards. Gary Whitta's screenwriting credits include 2010'sThe Bookof Elistarring Denzel Washington. He is also well known as a journalist and editor in the video game industry, as well as part of the BAFTA award-winning team on Telltale Games' adaptation ofThe Walking Dead. Whitta states, "From the moment I first saw the original movie as a wide-eyed kid,Star Warshas been the single most profound inspiration to my imagination and to my career as a writer. It is deeply special to me, so to be given the opportunity to contribute to its ongoing legacy, especially in collaboration with a film-maker as talented as Gareth, is literally a dream come true. I'm still pinching myself."